With such sketchy information, one might be led to think the riot cops are there to deter crime or rioting. In fact, as part of Israel’s occupation of East Jerusalem to expropriate it from Palestinians & as part of its on-going campaign to destroy the Al-Aqsa Mosque in East Jerusalem, Israel has banned all males under 50-years-old from observing Friday prayers. 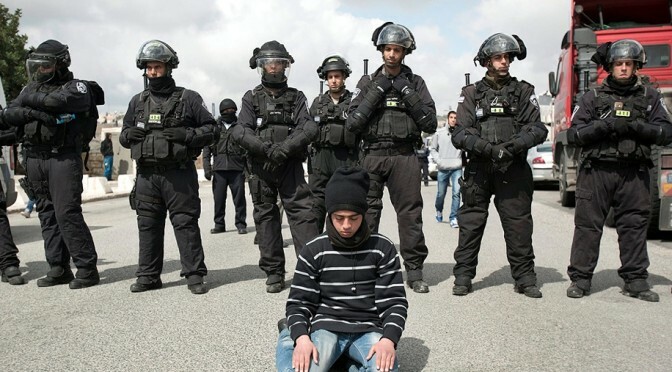 Hundreds of Palestinian boys & men are forced to pray kneeling on the public streets. So this young guy is not only exercising religious freedom; this is a courageous act of political defiance. Protestors around the world who have faced phalanxes of riot cops know just how courageous this is since at any moment this young man could be beaten to a pulp. Long live Palestinian intifada! No military aid to Israel! Support the Boycott, Divestment, & Sanctions movement against Israel! Previous PostEmancipation US-style in AfghanistanNext PostDon’t let the barbarisms get you down!